This chapter represents a remarkable turn in the story. In chapter 32 the people turn away from the way of the LORD and for the LORD this is an incredible betrayal which plunges the LORD into intense emotional pain and causes the LORD to distance from the people. The LORD’s wrath threatens to consume Israel, but Moses stands between God and the people. In chapter 33 Moses attempts to reconcile the people and God, and here, as we begin this chapter, the healing begins with God reclaiming God’s identity. There will be a new covenant, a new beginning and God will be who God will be despite of the peoples’ disobedience. Pain can threaten to obscure our identities and can cause people to act in ways that seem discordant to the way they would normally act. In Exodus, the LORD’s merciful and gracious nature is threatened by the other portion of the LORD’s identity that expects faithfulness and obedience. The LORD’s emotions in Exodus are surprisingly human in nature. Yet, here after a time of grieving and making sense of the broken relationship the LORD moves in the direction of forgiveness and reclaims the identity the LORD chooses. The name of the LORD is proclaimed multiple times and there is an almost joyous quality in this proclamation. This seems to be a moment of rediscovery for God and then we for the first time hear what is known as the Thirteen Attributes of God. These attributes are repeated fourteen times throughout the Hebrew Bible and alluded to many others. (Myers, 2005, p. 264) Within God’s identity lies a paradox: forgiving iniquity, transgressions and sins yet also accountability for iniquity. The LORD chooses to be both gracious and just. The LORD chooses to be slow to anger and yet to remain in Ellen Davis’ words a ‘fool for love’ (Davis, 2001, p. 153) God chooses the path of being vulnerable to the people of Israel. Many people I have talked to question the final portion of these thirteen attributes where it talks about visiting the iniquity of the parent upon the third and fourth generation. On the one hand, this contrasts the steadfast love that goes until the thousandth generation which attempts to contrast the expansiveness of God’s steadfast love with the limited nature of the judgment of God. It also is something that God will respond to in Jeremiah 31: 29-30 where the children will no longer be held accountable for their parent’s sins but instead everyone will be accountable for their own sins. Finally, it is also something that I have seen play out within family systems where an iniquity, violation, brokenness or sin has impacts not only on the person who commits it but for generations to come. Regardless this is a part of the paradox of God’s identity, a God who refuses to be taken for granted, a God who cares enough to be wounded by the brokenness of God’s followers and yet chooses to be merciful, gracious, slow to anger and abounding in steadfast love. God has chosen to reclaim God’s own identity and now God chooses to reclaim the people of Israel. God again moves towards them, restates that God will provide for them and go with them as they move toward the promised land. This is one of the steps toward a renewed relationship. God chooses the people again and reenters into the covenant with them. God moves beyond God’s pain and back towards God’s people. 26 The best of the first fruits of your ground you shall bring to the house of the LORD your God. You shall not boil a kid in its mother’s milk. Several portions of the exposition of the law are revisited here as the covenant is reestablished. Verses 11-16 restate and heighten the words of Exodus 23: 20-33 where the commandment not to have other gods is highlighted in the context of their coming occupation of the promised land. Here in addition to making no covenant with the people of the land they are also told not to intermarry with them. The people have already shown a predisposition to copy the practices of the other nations and this serves as another reminder that they are to worship the LORD alone. After the command not to create idols is restated there is a reminder of the festivals of Exodus 23: 14-19, the reminder of the dedication of firstborns which is outlined in Exodus 13: 11-16, the essential nature of Sabbath in Exodus 23: 10-13. While I could restate much of what I have written before exploring these commandments here I think it is important to highlight the necessity of restating them as the covenant is being renewed. With the new tablets which bear the ten commandments (or ten words of God, see Exodus 20) there is also a renewal of the expectation of living in obedience to these commandments. There is a new chance for the people to order their society in a manner that reflects the justice of a covenant people. Restating the expectations for the relationship between the LORD and the people becomes another step in restoring the relationship. 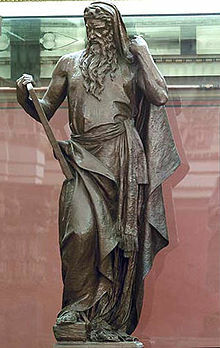 Statue of Moses at the Library of Congress, Washington D.C. The time spent by Moses in the presence of God has a transforming effect upon Moses. While the changes are invisible to Moses they are clearly seen by Aaron and the people and it is a cause for fear. This time in God’s presence has made Moses different from the rest of the people, he continues to stand apart. In his role as mediator between God and the people he seems to have brought a little bit of God’s presence back with him. The presence of God does change people. Moses enjoys a far greater intimacy with God than any other person among the Israelites. Moses has shown great faithfulness to God and to the people as well. Moses is more than an emissary for God or even a prophet of God but one who God trusts and speaks to like one speaks to a friend. Moses has something that even Aaron will never have. Aaron and the priests will need things to announce them before God and will only be allowed to enter God’s presence rarely. Moses dwells both with God and the people. Yet, Moses seems to belong more with God now than the people. Among the people Moses needs to wear a veil to fit in, but in God’s presence Moses doesn’t need to hide the radiance of who he is. This entry was posted in Biblical Reflections, Exodus and tagged Exodus, Exodus 34, healing, identity, Moses, Moses' Shining Face, Reconciliation, Thirteen Attributes of God, Transfiguration Year C. Bookmark the permalink.